Flowers are nature's beautiful creation. Glimpse of flowers mesmerizes every human being. I strongly believe that flowers enhance peace, love and positive energy in the home and there by stimulate emotional and physical healing. I love to secure a little spot in the home with fresh flower vase. Here in USA we have beautiful choice of fresh flowers available in grocery shops...just spending four to eight dollars one can create nice flower arrangement..adding some stems, leaves and bushes found around home adds beauty to flower arrangement. Last year I started to post pictures of these arrangements at the right corner of the blog. I love this ritual. 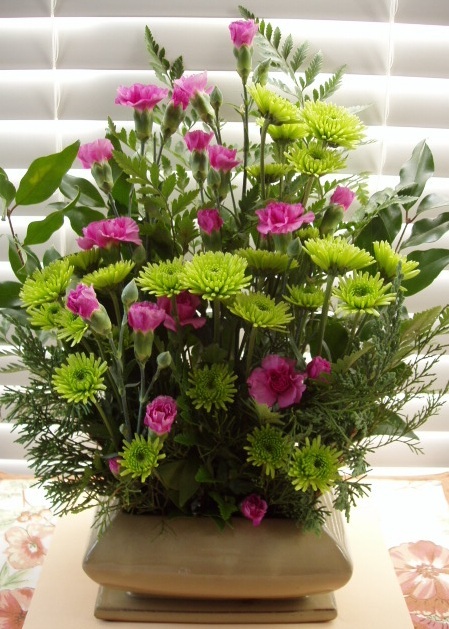 In this post I am collecting all last years captured flower arrangements...Enjoy!! Parsley, Mint flowers, random leaves from woods. except that violet flower stem..all collected from backyard. beatufil flower arrangements.. I wish i can do so , cause i do have some lovely flowers in my garden .. I wish to see some of them on my desk in office. Lovely. maza aa gaya....very cool....i will try too. how do u adjust height ? do u use a tool to secure the flowers in place? Sm, Thanks for appreciation and wishes. @Bikram, Nice to see you here..don't wait.. go ahead and start arranging them in vase. It just need wish and no formal knowledge..slowly and spontaneously you will start creating nice arrangements. Thanks for your visit and comments. @Mak, Nice to see you again..thanks for appreciation..pick very tiny vase and just add one or two flowers and place it at the corner of your desk..you will love it. Jack, Thanks...Nice to see you back. @Dolly, I am so glad that you enjoyed seeing those arrangements. You buy some floral foam block from local craft store...cut it as per size of vase and secure those flowers..this helps when you choose flat vase..Also buy some moss, it will help to mask visible foam and will be useful in other plant pots too...In India I used to place pin holder to secure flowers but it is not easily found here..so foam works better and best. Beautiful beautiful flowers. How did I miss this post? Kiran, Thanks for taking moments to appreciate flower arrangements...as far as happy life, there is never a perfect state of being happy..life is mix and match of several emotions and good and bad time. I keep cool and face them. 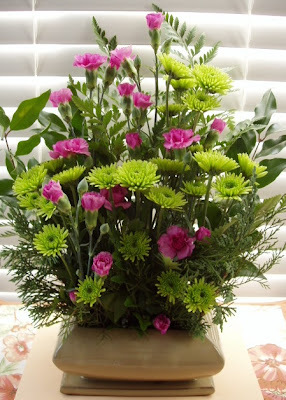 @OnlineFlorist, I am surprised you reached to this post and left a link..Google is amazing. I checked it..nice arrangements. @A, You didn't miss..Thanks for appreciation. That is so pleasing to the eye and the soul! I stumbled into your blog searching for garden tips and found your flower arrangement. Pattu, Thanks for visiting and appreciating flower arrangements...I have just one or two posts related to garden..In summer I nurture few plants in pots. You didn't leave the link of your blog...I made search on your name and found one blog and left comments..hope I reached the right blog.